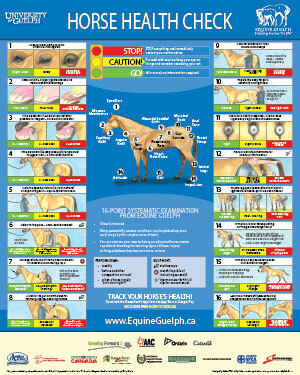 Equine Guelph's new Horse Health Check poster is an indispensable tool for any horse owner who wants to give the best possible care to their horse. This handy reference tool provides a quick and easy 16-point systematic method to check vitals, figure out normal baselines and alert you when potential health problems are brewing. In partnership with the Ontario Ministry of Agriculture and Food, Equine Guelph is developing an equine welfare educational initiative, "Full-Circle-Responsibility", which stands to benefit the welfare of horses in both the racing and non-racing sectors.